NEI recently had its first birthday and we wanted to first give a big THANK YOU to all of the individuals that made what we do possible. The Barton Football Academy is the largest in the Pacific Northwest with countless D1 and NFL athletes now on TV every Saturday and Sunday. There are currently 5 potential NFL starters (QB’s), this 2012 season that have trained at the Academy. There are many more at the skill positions and on the line. With the addition of NEI we have been able to help elevate recruiting of our northwest athletes to an all time high. There are a lot of people to thank such as Scout.Com, ESPN represented by Mason Kelley, Dawgman.Com, Oregon Live, KJR Radio, 1080 The Fan, and the Seattle Times. Rivals.Com is a respected national company, but is still looking for a quality local representative. Taylor Barton is considered by many to be the top QB coach in the land as the numbers don’t lie. TB and I played together for most of our lives and were fortunate to have some of the best coaching in the country with football, baseball, and basketball considered. All of this said as we are currently expanding at NEI and want to be able to keep up with the growth of the academy, and the increased interest of our Pacific NW athletes. We would like to announce an addition to the team, and someone that TB and I would both say is going to be very special in Ryland Spencer. Very few if any people know Washington HS football better, as Spencer grew up a lifelong resident of Kirkland, Wa and can reference a host of games that took place 20+ years back, although he’s only 28 years old. Spencer says, ” I love small school football. Little cities that shutdown on game nights is what football is all about to me”. He adds, “I really can’t get enough high school football. I find myself watching film any free chance I get. You just never know when you will find a kid that nobody else has noticed. I find myself watching film for a RB just to see what his lineman are doing”. You can read more of Spencer’s bio below. Everything we do at NEI/Barton Football is based on a passion for the game, and love of the kids that represent our region. Spencer shares that passion and then some so we are excited to have him on board working with the Washington athletes, many of whom he already knows. Northwest recruiting by percentage has picked up more then any other given area in the country. Spencer is a guy that won’t let hidden talent go unnoticed , so for any of you out in the sticks thinking you don’t have a chance of being seen think again. TB and I along with Scott Eklund from Dawgman have had an exciting year to say the least. We couldn’t be happier to announce the addition of Ryland, as we feel he will be an asset for everyone involved with Pacific Northwest High School Football. Have a look below at Ryland Spencer’s bio and get used to the name. We look forward to an outstanding 2012 season, and are excited to build on what was an incredibly successful year. Stay tuned this week as we announce all of the TV and Web Cast games that we will be doing with Bob Akamian during the season. We will have 2 in Oregon and 2 in Washington with the TV game being on Xfinity. Ryland Spencer will be working with our Washington athletes. Life long resident of Kirkland, WA. 2002 graduate of Juanita High School. He loves all sports but typically like the college, minors, juniors or high school game the most. He is a Seahawks season ticket holder and likes to travel to one away game a year. Spencer love road trips and seeing high school football stadiums. 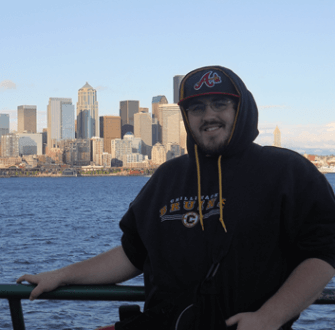 On January 1st of 2011 he started a journey to see every stadium in the state of Washington and takes pictures of the stadium then posts them on a Facebook page (http://www.facebook.com/wshsfs). He coached Jr Football in the Auburn Panthers organization from 2008-2010. Working with kids 11-14 on the offensive and defensive lines. His three favorite high school athletes of all-time are Jon Eide from Juanita played at Stanford, John Fiala from Lake Washington played at UW and in the NFL with Pittsburgh and Tyson Thompson from Inglemoor who ended up at Wazzu and in Minor League baseball.